Known in French as Le Trésor de Beaurains (dit Arras). It was discovered by Belgian workmen in September 1922. Much of it was stolen during the course of the excavation and no-one knows the full extent of the original hoard. Despite rumours of some coins being melted down, it is believed that many were spirited out of the country and may remain in private collections to this day. One estimate gives a total of over 700 coins – 30 to 35 gold medallions, more than 400 gold aurei and about 70 silver coins. There was also a considerable amount of gold jewellery. The American Numismatic Society (ANS) owns 56 specimens from the hoard and further information about these can be found on their website. Facsimiles of the large gold medallions of this hoard are very collectable and, compared to the originals, are both affordable and attainable. In the late 1920s M. Etienne Bourgey of Paris was fortunate enough to purchase the owner’s share of the Arras treasure. This included six of the nine large gold medallions. M. Bourgey made high quality electrotypes of his medallions and was also given sole rights to copy the three medallions retained by the city of Arras. The electrotypes, in gilt copper, were of the finest quality and were produced for institutions and collectors. They were produced in a limited edition and were all numbered on the edge. The British Museum possesses a set and they are frequently displayed. In January 1928, the two page advertisement shown above appeared in Spink’s Numismatic Circular. Sets of these electrotypes were available for £10 each including case or one could buy a copy of the Arras medallion on its own for the princely sum of £3. The smaller medallions could be had for a £1 a piece. These electrotypes occasionally come on to the open market, either singly or in sets. They are keenly competed for when they do, but are still far more affordable than original gold pieces from the hoard. PS And yes, I did check with Spink and they are all sold out! Babelon J. and Duquenoy A., Médallions d’or du Trésor d’Arras, in Arethuse January 1924. 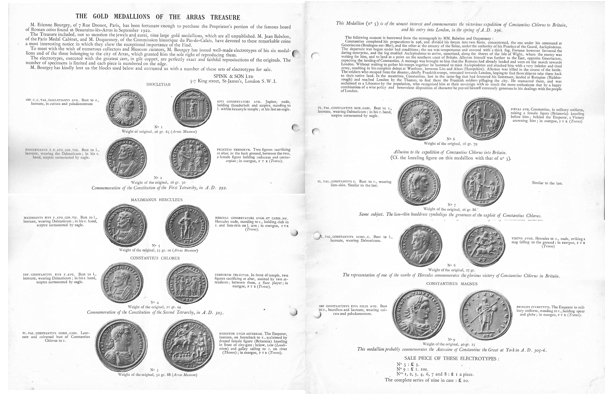 Baldwin Brett A., The Aurei and Solidi of the Arras Hoard, Numismatic Chronicle, 1933. Baldwin, Agnes, Four Medallions from the Arras Hoard, Numismatic Notes and Monographs, #28, 1926. Bastien P. and Metzger C., Le Trésor de Bearains (dit Arras), Wetteren, 1977. Ratto, Sale Catalogue, April 1923. ANS Website – Arras Coins at the ANS.